A team of researchers from Neuroscience Research Australia (NeuRA) and UNSW Sydney has received a grant from The Michael J. Fox Foundation and the Shake It Up Australia Foundation for Parkinson’s Research to test eHealth and smart garment technologies to prevent falls in people with Parkinson’s disease. 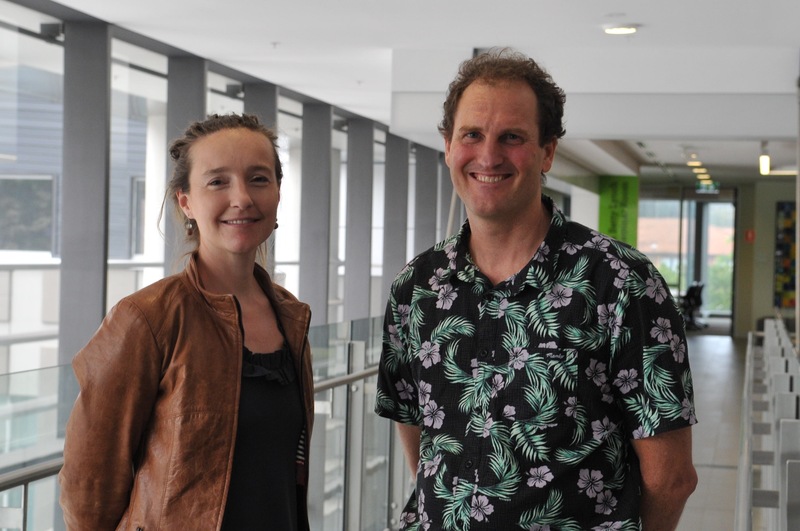 NeuRA’s Dr Matthew Brodie and Associate Professor Kim Delbaere, who lead the study, are working with industry partner Sensoria Health and aim to make StandingTall-PD the leading eHealth solution for maximising mobility and preventing falls in people with Parkinson’s disease. Falls are a common and often devastating event in the lives of people with Parkinson’s disease. They are frequently caused by gait impairments, postural instability and freezing-of-gait, a brief absence of forward momentum of the feet despite the intention to walk. The neuro-rehabilitation program, known as StandingTall-PD, uses visual, audio and sensory cues to help rewire the parts of the brain that control walking in people with Parkinson’s. The program aims to prevent freezing-of-gait and falls, and enhance participants’ independence. Investment from Sensoria Health includes the development of the textile sensor infused Smart Socks with haptic feedback and core microelectronics for the study. Participants will be given a NeuRA training mat with colour-coded stepping targets, a pair of Sensoria Smart Socks, an iPad and phone. The program, practised daily, will encourage participants to step on coloured stepping targets that match a series of colours displayed on their iPad. 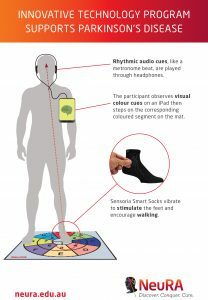 At the same time, they will listen to rhythmic auditory cues like music and a metronome beat that are synchronised with the vibrating Smart Socks. The combination of visual, audio and sensory elements helps to form new connections in less affected parts of the brain, leading to improved walking ability. The program enables participants to self-manage and monitor their own progress via an app on their phone. The app can also trigger stimuli during everyday activities, such as vibration in their Smart Socks, if they are in danger of experiencing freezing-of-gait, falls or if they show signs of shuffling feet. Clinicians can also monitor participants’ progress remotely and adjust the program to provide ongoing and personalised continuity of care. “People with Parkinson’s disease have substantial barriers to maintaining their independence. Our program has individually tailored tools to empower all people with Parkinson’s to manage their symptoms, increase capacity to remain independent and enjoy the highest possible quality of life,” says Dr Matthew Brodie. “Working with our global partners, our program has the potential to impact the way Parkinson’s disease is treated around the world,” adds Dr Brodie. Associate Professor Kim Delbaere says the funding gives hope to people with Parkinson’s. Professor Peter Schofield, CEO of NeuRA says falls are a frequent and often harmful occurrence for people living with Parkinson’s disease. “The StandingTall-PD program is a big step towards reducing the burden of disease associated with Parkinson’s in Australia and around the world,” says Professor Schofield. Davide Vigano, CEO of Sensoria Health Inc., says smart footwear has the potential to change the way in which physicians and people with Parkinson’s access personalised healthcare. Clyde Campbell, Founder and CEO of the Shake It Up Australia Foundation says the potential to reduce falls for people living with Parkinson’s is a priority. “Tripping, freezing & falls happen all too often in people With Parkinson’s. If we can minimise or eliminate falls we will reduce injury and this is well aligned with our strategy to provide better treatments whilst on the journey to slow, stop and cure Parkinson’s disease,” says Clyde Campbell. Dr Brodie and A/Prof Kim Delbaere are available for comment.